The Mekong. One of the world’s greatest rivers; a vital artery bringing life to grand cities and remote communities as it snakes through stunning landscapes from the mountains to the sea. Experience the best of this iconic river, in style, aboard a luxury river cruise through Cambodia and Vietnam. Witness the sunrise over centuries-old Angkor Wat before exploring this impressive monument for yourself, learning of the rich history and culture of the Khmer Empire. Then, climb aboard the 4-star Lan Diep river ship and experience the wonder of the Mekong over nine incredible nights. Discover Kampong Chhnang, one of the largest fishing ports on the Tonle Sap lake; visit the Vihara of the Wat Kampong Tralach Leu Pagoda, set among beautiful rice fields; and enjoy free time and a guided tour of Phnom Penh, Cambodia’s impressive capital. Cross the border into Vietnam and experience the river port of Sa Dec, known for its stunning flower farms; travel by small boat among the orchards of Cai Bec, enjoy a guided tour of Ho Chi Minh City and more! Package includes return international flights, a relaxing nine-night Mekong river cruise, English-speaking local tour guides and more. 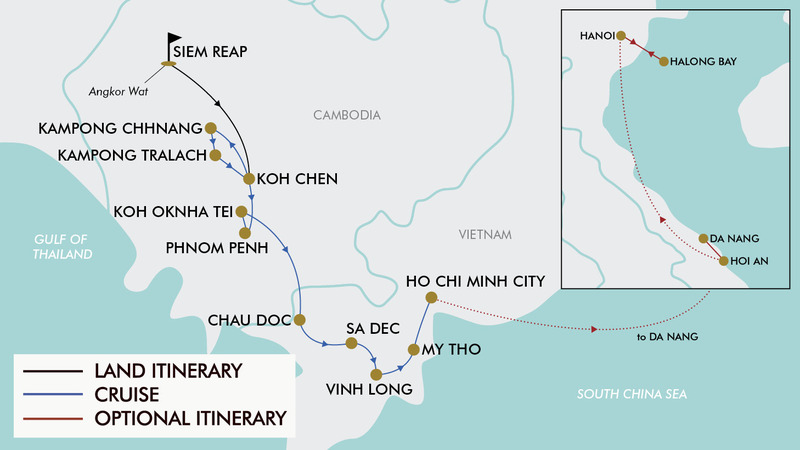 If you long to discover Vietnam and Cambodia, this is the trip you’ve been waiting for! Have more time? Choose from a pre-tour extension in Siem Reap, a post-tour extension in Hanoi and Halong Bay, or combine the extensions to experience the best of both worlds! The choice is yours. Today depart from either Sydney, Melbourne, *Brisbane, *Adelaide or Perth for your flight to Siem Reap, Cambodia. Fly with either Vietnam Airlines, Cathay Pacific or Singapore Airlines to name a few (subject to availability). On arrival be picked up by a tour representative and transferred to the hotel. This morning wake before sunrise and transfer to Phnom Bakheng, one of two hills dominating the plain of Angkor. From here you will have a spectacular view of the Western Baray and Angkor Wat. Afterwards return to the hotel for breakfast. After breakfast and checkout you will drive back to the Angkor complex to visit the most famous of all the temples on the plain of Angkor: Angkor Wat. The temple complex covers 81 hectares and is comparable in size to the Imperial Palace in Beijing. Its distinctive five towers are emblazoned on the Cambodian flag and the 12th century masterpiece is considered by art historians to be the prime example of classical Khmer art and architecture. Afterwards transfer onwards to the town of Koh Chen by air conditioned bus (approx. 5 hours) and upon arrival embark the 4 star ‘Lan Diep’ ship, your home for the next 9 nights. Once on the ship, enjoy a welcome cocktail and an introduction to the crew. This evening enjoy dinner as the ship drops anchor. Today enjoy breakfast and lunch onboard. Early this afternoon the ship will cruise into Kampong Chhnang. Located some 90km from Phnom Penh, the town of Kampong Chhnang is one of the largest fishing ports on the Tonle Sap. The region is best known for its fine traditional pottery which is a major source of revenue for the entire country, and the region's very name Kampong Chhnang means “the port of the pottery” in Khmer. Taste some palm sugar from the Thnot sugar palm (a real national symbol) before enjoying a little cruise around the village on small local boats. Afterwards return to the ship and continue cruising to Kampong Tralach where you will enjoy dinner onboard. Drop anchor and moor for the night near Kampong Tralach. This morning enjoy breakfast onboard before visiting the beautiful Vihara of the Wat Kampong Tralach Leu Pagoda. You will travel through the village of Kampong Tralach to reach the pagoda on a small path running perpendicular to the river amidst a magnificent landscape of rice fields. The Vihara dates back to the beginning of the last century and has many magnificent wall paintings which are starting to suffer from the effects of time. Completely isolated in the middle of the rice fields, the pagoda is quite unassuming and does not receive many visitors, so its isolation makes it a truly magnificent spot. Return to the ship for lunch and cast off. Arrive into Koh Chen in the afternoon and visit this small village where the inhabitants are experts in silverwork and copper work. Here they make the ornaments and decorations used during traditional ceremonies in the pagoda or for weddings. Afterwards return the ship and cruise to Phnom Penh where you will arrive late in the afternoon and you may enjoy some free time in the capital. This evening return to the ship and enjoy an Apsara dance show and dinner onboard. Moor for the night in the port of Phnom Penh. Founded in 1434, the capital of Cambodia retains much of its French colonial charm, thanks to the rehabilitation of part of its architectural heritage. Today visit the Silver Pagoda, paved with over 5000 silver tiles to which it owes its name. Constructed in wood in 1892 it was then rebuilt in 1962. Also visit the Royal palace, symbolic heart of the nation and one of the finest examples of Cambodian architecture in classical Khmer style. Next, visit the National Museum housing the Fine Arts Museum, built in 1917 by the French in traditional Khmer architectural style. Also visit a beautiful Lapidary Museum, where the sublime statue of Javayarman VII sits with the head slightly tilted in a meditative posture. Enjoy lunch in a local restaurant and this afternoon you will have the option to visit Tuol Svay Prey School S21 a former centre used by the Khmer Rouge during the War. Enjoy some free time in the “Central Market” which is crammed full with all types of businesses before you return to the ship and enjoy dinner. Today cruise to Silk Island. Silk Island, also known as Koh Oknha Tei in Khmer - gained its name from the island’s primary occupation, silk weaving. Visit a traditional silk-weaving centre on the island, featuring villages demonstrations, shops and tours. Afterwards enjoy some free time at leisure in Phnom Penh. Return onboard and enjoy dinner as you continue cruising through the night to Vietnam. Today enjoy breakfast and the morning onboard before crossing into Vietnam and completing customs formalities at the border. Enjoy lunch onboard and arrive into Chau Doc in the early afternoon. Situated in the heart of a gigantic grid of rice fields, the city of Chau Doc embraces both banks of the Mekong and the floating farms overspill into the waters. Chau Doc is a very prosperous town which developed around fishing and farming. Inside the town, a few colonial buildings with their old fashioned charm still remain. The market which surrounds them is the vibrant heart of the city. Transfer by small boat to visit a Cham Village, a village of silk weavers and fish farms. Then set off by minibus and visit the top of Sam Hill, an important place of pilgrimage for the Vietnamese where it overlooks the vastness of the Delta and its rice fields. Return onboard and continue cruising towards Sa Dec. This evening enjoy dinner and the overnight stop on the river bank. Today continue the journey to Sa Dec, where a few colonial mansions are still in existence. Discover the local market and visit the former dwelling place of Huynh Thuy Le, former lover of the French novelist Marguerite Duras who spent part of her childhood in Sa Dec. The drowsy former capital of the Dong Thap Province, is a comparatively peaceful city of tree-lined streets and fading colonial villas, ringed with orchards and flower markets. Return to the ship for lunch and continue cruising towards Vinh Long, which is located in the middle of the delta region, between two arms of the Mekong and where life is organised around the water. Hundreds of boats criss-cross in all directions between houses built on stilts. Set off in boats through the orchards that lead to the Caï Be district, famous for its floating markets. Here you will discover the bricks, pottery and chinaware of the region. You will also learn the local traditional craft of rice popcorn, making rice wafers for the production of spring rolls, the production of rice alcohol and the making of coconut sweets. Also enjoy an opportunity to see the fruit tree nursery on the island of Binh Hoa Phuoc. Afterwards return to the ship and continue the cruise. Enjoy dinner and overnight onboard at a mooring point near My Tho. Early this morning enjoy breakfast onboard before visiting the near islands of My Tho in small local boats. Renowned for its many vegetable gardens, fruit orchards, the climate here is hot and pleasant all year long. The surrounding countryside includes one of the most luxuriant gardens in Vietnam with coconut, banana, mango and logan trees. Along the maze that makes up the network of small canals, pretty country villages appear and you will see the local craftsmen at work. On the largest of the islands, (Thoi Son) you will visit a beekeeping farm where you will taste honey tea and exotic fruits. Return onboard for lunch and continue with your magnificent cruise, taking in the Chao Gao Canal and heading for Ho Chi Minh City (formerly Saigon). Built by the French in 1850 at the beginning of French colonial times and the principal port of Vietnam. Enjoy dinner and overnight onboard in the port of Ho Chi Minh City. After dinner your evening is free at leisure. The cruise port is conveniently located in the heart of Ho Chi Minh City. After breakfast this morning enjoy a tour of Ho Chi Minh City. Visit the Reunification Palace, Notre Dame Cathedral, Central Post Office and the National History Museum. Enjoy lunch onboard before departing this afternoon by coach to the Cu Chi tunnels. A former hiding spot for Viet Cong soldiers, it serves today as a reminder of everyday life during the Vietnam War for both soldiers and civilians. You'll learn all about their clever survival techniques and the impressive network of tunnels they constructed. Return to the ship this evening for a farewell cocktail and gala dinner. After breakfast disembark and transfer to the airport for your return flight back to Australia. Please note: some Perth customers may depart day 11 and arrive home day 11. Today is free at leisure to enjoy the magnificent city of Siem Reap. Enjoy another day free at leisure. This morning enjoy breakfast onboard before visiting the beautiful Vihara of the Wat Kampong Tralach Leu Pagoda. You will travel through the village of Kampong Tralach to reach the pagoda on a small path running perpendicular to the river amidst a magnificent landscape of rice fields. The Vihara dates back to the beginning of the last century and has many magnificent wall paintings which are starting to suffer from the effects of time. Completely isolated in the middle of the rice fields, the pagoda is quite unassuming and does not receive many visitors, so its isolation makes it a truly magnificent spot. Return to the ship for lunch and cast off. Arrive into Koh Chen in the afternoon and visit this small village where the inhabitants are experts in silverwork and copper work. Here they make the ornaments and decorations used during traditional ceremonies in the pagoda or for weddings. Afterwards return the ship and cruise to Phnom Penh where you will arrive late in the afternoon and you may enjoy some free time in the capital. This evening return to the ship and enjoy an Apsara dance show and dinner onboard. Moor for the night in the port of Phnom Penh. After breakfast disembark and transfer to the airport for your return flight back to Australia. Please note: some Perth customers may depart day 13 and arrive home day 13. After breakfast disembark and be transferred to the airport for the flight to Da Nang (approx. 1.5 hours). Upon arrival you will be transferred to the hotel in Hoi An. Graceful, historic Hoi An is Vietnam’s most atmospheric and delightful town. Once a major port, it boasts the grand architecture and beguiling riverside setting that befits its heritage, and the 21st-century curses of traffic and pollution are almost entirely absent. Today enjoy a day at leisure to discover Hoi An or join an optional activity (not included). After breakfast you will be transfer back to Da Nang Airport for your onwards flight to Hanoi, the capital city of Vietnam in the northern part of the country. (approx. 1.5 hour). Upon arrival you will be transferred to the hotel and you may enjoy the remainder of the day at leisure. This evening you will be picked up from your hotel and transferred to one of the best restaurants in the Hanoi’s famous Old Quarter - Duong’s Restaurant. Here you will enjoy many Vietnamese traditional dishes such as Goi Cuon tom thit (fresh roll with prawn and pork), Pho bo (noodle soup with beep), Bun Cha (BBQ pork in “nuoc mam” dressing eat with noodle), Goi Ga hoa chuoi (banana blossom salad with chicken) and Che nep dua (sticky rice in coconut cream). After the dinner you will transfer to a water puppet theatre for a spectacular water puppet show. Vietnamese water puppetry is a traditional and unique art of Vietnam. Each show lasts 45 minutes and includes lively illustrative Vietnamese pastoral scenes, rural daily life as well as fairy legends. (The itinerary may be adjusted if the water puppet show at 8:00pm is not available the water puppet show will be arranged at 6:30pm and the dinner at the restaurant after the show). Today transfer from the hotel to the airport for your return flight back to Australia. Please note: some Perth customers may depart day 16 and arrive home day 16. Early this morning enjoy breakfast onboard before visiting the near islands of My Tho in small local boats. Renowned for its many vegetable gardens, fruit orchards, the climate here is hot and pleasant all year long. The surrounding countryside includes one of the most luxuriant gardens in Vietnam with coconut, banana, mango and logan trees. Along the maze that makes up the network of small canals, pretty country villages appear and you will see the local craftsmen at work. On the largest of the islands, (Thoi Son) you will visit a beekeeping farm where you will taste honey tea and exotic fruits. Return onboard for lunch and continue with your magnificent cruise, taking in the Chao Gao Canal and heading for Ho Chi Minh City (formerly Saigon). Built by the French in 1850 at the beginning of French colonial times and the principal port of Vietnam. Enjoy dinner and overnight onboard in the port of Ho Chi Minh City. After dinner your evening is free at leisure. The cruise port is conveniently located in the heart of Ho Chi Minh City. Today transfer from the hotel to the airport for your return flight back to Australia. Please note: some Perth customers may depart day 18 and arrive home day 18. Travel offer is valid for travel on selected dates until the 10 September 2020. Please note: dates/months with a * incur a high season surcharge of $100 per person. - An outbound stopover only may be chosen. The Lan Diep is a 22 cabin river vessel, inspired by the Mekong’s ancient tradition of riverboat building. The vessel is spacious, elegant and luxurious. Lan Diep’s strong metallic hull is gently embedded in an exquisite wood, period-style finishing. Its spacious cabins (16m2) are exquisitely fitted-out with Cambodian tropical hardwoods and palm wood for a decorative finish and an authentic feel and a large panoramic window will give you a clear view of the river and over the beautiful Cambodian & Vietnam countryside. All cabins include en suites furnished with brass fittings and exotic natural wood, in-room air conditioning, quality linens, duvets & premium mattresses, complimentary tea, coffee & drinking water along with a turndown service in the evening. During your cruise all shore excursions mentioned in the itinerary are included and will be led by an English speaking guides. All meals are also included and a local executive chef heading an experienced culinary team will provide high quality meals with buffet breakfasts and lunches and a set menu for dinner. Please note: during the high water season (approximately September to December), if water levels permit, you may be able to board the cruise in Siem Reap, and cross the Tonle Sap lake the following day instead of boarding in Koh Chen. The currency aboard the RV Lan-Diep ship is the US dollar (preferably in small denominations). During embarkation, you can leave your credit card imprint so as to account for and pay all your onboard expenses at the end of the cruise. You will be able to pay them by Us Dollars or Credit card (Visa or MasterCard). - Recommended gratuities/tipping: $10 USD per traveller per day, which will be collected whilst on tour for cruise component. $7 USD per traveller per day, which will be collected on tour for post tour extension land services. The dry season lasts from December to April, but the atmosphere remains humid (25°C to 30°C). During the rainy season which runs from May to October, there are frequent violent but short rain storms which usually occur towards the end of the afternoon but regardless river cruising on the Mekong is a year round operation with great experiences to be had any month of the year. Please note: a basic level of fitness will be required. Customers may be required to transfer to smaller local boats for optional excursions which will require some mobility. These are excursions are optional and not compulsory. If you have any concerns please consult your healthcare provider prior to purchase/travel. Gratuities (tips) are not included in the tour price for services of the cruise staff and tour services provided throughout the cruise. The recommended tip is $7 USD per person per day for all the cruise staff onboard the ship, and an additional $3 USD per person per day for tour services (e.g guides & drivers) throughout the tour. For customers purchasing the post-tour extension, the recommended tip is $7 USD per person per day when services are provided and this covers the guides/drivers. Please note tipping is only recommended and is not mandatory. Australians are eligible to apply online for a single entry electronic visa (e-visa), valid for up to a maximum of 30 days. Lodge your application online (for a non-refundable fee) with the Vietnamese National Web Portal of Immigration - https://www.xuatnhapcanh.gov.vn/ . You will be given a unique code to track your visa application status. Once your visa is granted, you must print it out and present it at check in. Keep this e-visa print out with you at all times during your travel in Vietnam. - Cambodia will be completely arranged on arrival at the border for $35 USD per person.